For the last five days the tables at King’s Casino in Rozvadov, Czech Republic have been buzzing as WSOP Europe 2017 kicked off with the €1,100 Monster Stack event. 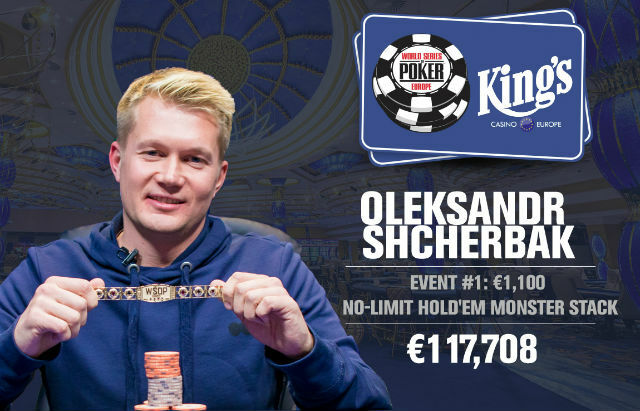 On Monday after that buzz hit a fever pitch as Ukrainian Oleksandr Shcherbak eliminated four of his final eight opponents in the €1,100 Monster Stack to win his first career bracelet and €117,708. With blinds at 25,000/50,000 (5,000 ante), Ali Sameeian moved all in for 705,000 from UTG and Shcherbak called from the button. Sameeian showed only to get bad news when Shcherbak happily tabled . The board ran out to eliminate Sameeian in ninth place. Ismael Bojang, who picked up eight cashes at the WSOP this past summer, was hoping to finally win his first WSOP bracelet, but after making the final table as the short stack, he ran into a cooler. Action folded to Walter Treccarichi in the hijack and he moved all in for 670,000 and Bojang called all in from the big blind. Treccarichi turned over while Bojang was drawing thing with . The flop didn’t offer Bojang much in the way of hope and the turn sealed his fate. The meaningless river was the and Bojang was eliminated in eighth. Two hands later, another player was sent home early. Treccarichi raised to 125,000 from UTG+1, Carlo Savinelli bet 265,000 from the button before Serge Danis moved all in for 250,000 from the big blind and Treccarichi folded. Savinelli showed while Danis was slightly ahead with . The flop changed things for the worse for Danis and after the turn and river were dealt, he was out in seventh place. Five hands later, Shcherbak picked up another elimination, this time relying on some drama to make it happen. Shcherbak opened to 120,000 from the button before Peter Bstieler moved all in from the small blind. Shcherbak called and tabled while Bstieler showed . The flop put Bstieler ahead with a set of sevens. The turn was the but the river was the , giving Shcherbak a set of nines to eliminate Bstieler in sixth. Treccarichi started the final table in the middle of the pack and went out accordingly. The Italian moved all in for 920,000 from the button, only to have Shcherbak call from the small blind. Treccarichi showed and found himself racing against . The flop was safe for Treccarichi, as was the turn but the river gave Shcherbak a pair of queens and scored him his second consecutive dramatic finish to eliminate Treccarichi in fifth. The quick pace continued as four hands later, Savinelli went out in fourth. Savinelli moved all in from UTG for 1,125,000 and Viliyan Petleshkov called from the small blind and flipped over which was bad news for Savinelli who tabled . The board ran out to give Petleshkov the pot and eliminate Savinelli. Four-handed play lasted just 20 minutes before Shcherbak picked up yet another elimination. Sergio Fernandez, who began the final table with the chip lead, open-shipped from the button for 1,570,000 and Shcherbak defended his big blind. When the cards were turned up, Fernandez was ahead with to Shcherbak’s . The flop was safe, but the turn was the and when the hit the river, Fernandez was out in third place. Shcherbak and Petleshkov played heads up for nearly 90 minutes before another all in preflop confrontation ended the tournament. Petleshkov opened to 260,000 from the button, Shcherbak re-raised to 800,000 and Petleshkov re-raised all in for his last 4,115,000. Shcherbak called and turned over and found he was racing against Petleshkov’s . The [8[d] flop changed nothing, but the turn gave Shcherbak a set and left Petleshkov drawing dead. The river was and Shcherbak officially eliminated Petleshkov to claim his first WSOP bracelet and €117,708 ($138,420 US). The only WSOP Player of the Year contender to cash in the event was Ryan Hughes. He finished 20th to earn 45.77 POY points, enough to push him past Chris Ferguson and into the POY lead. The €1,100 buy-in event drew 561 players, pushing the prize pool past the €500,000 guarantee to €538,280.